The story of a young man fighting to recover from a devastating psychotic break and the mother who refuses to give up on him Zack McDermott, a 26-year-old Brooklyn public defender, woke up one morning convinced he was being filmed, Truman Show-style, as part of an audition for a TV pilot. This was it - his big dreams were finally coming true. Every passerby was an actor; every car would magically stop for him; everything he saw was a cue from "The Producer" to help inspire the performance of a lifetime. After a manic spree around Manhattan, Zack, who is bipolar, was arrested on a subway platform and admitted to Bellevue Hospital. So begins the story of Zack's freefall into psychosis and his desperate, poignant, often darkly funny struggle to claw his way back to sanity, regain his identity, and rebuild some semblance of a stable life. It's a journey that will take him from New York City back to his Kansas roots and to the one person who might be able to save him, his tough, big-hearted Midwestern mother, nicknamed the Bird, whose fierce and steadfast love is the light in Zack's dark world. Before his odyssey is over, Zack will be tackled by guards in mental wards, run naked through cornfields, receive secret messages from the TV, befriend a former Navy Seal and his talking stuffed monkey, and see the Virgin Mary in the whorls of his own back hair. But with the Bird's help, he just might have a shot at pulling through, starting over, and maybe even meeting a woman who can love him back, bipolar and all. 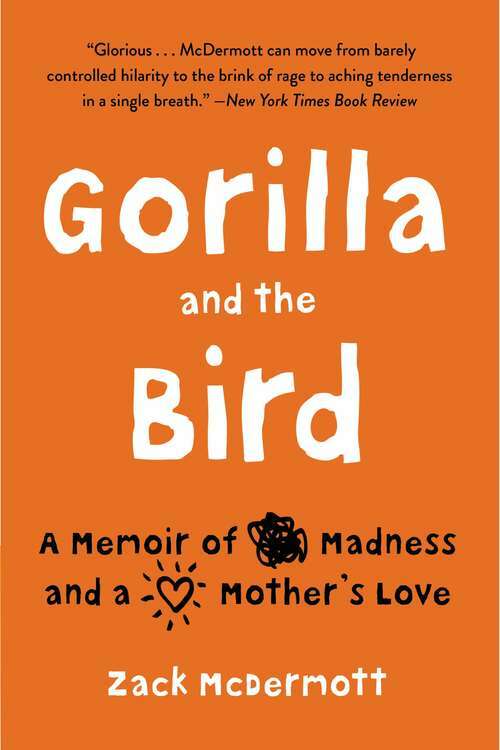 Written with raw emotional power, humor, and tenderness, GORILLA AND THE BIRD is a bravely honest account of a young man's unraveling and the relationship that saves him.